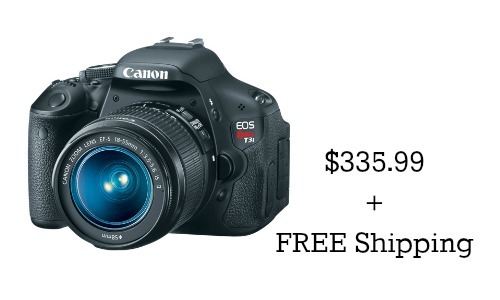 Canon has the Canon EOS Rebel T3i Camera for $336 shipped! This refurbished Canon EOS Rebel T3i Digital SLR Camera has 18-55mm Lens. This is a nice compact DSLR and offers the best performance of EOS technology for a really low price. It also has a 1-year warranty. If you debating getting this camera, I highly recommend. We have this camera and are never disappointed with the photos. It has a lot of fun features, but is easy for a beginner to learn to use. Plus, there are a ton of FREE online tutorials to help you get away from auto mode. If you’re looking for a nice lens, Canon is also offering an EF 50mm lens for $85.87. Want a new one? Amazon has a new Canon EOS Rebel T3i Camera for $499.